The three finishes bring variations in tonality and texture. Alongside existing pre-dampened bass drum heads, these are worth investigating. Good variety of sounds from the three different heads. Designed to filter out overtones and accentuate mid to low frequencies, Remo's Powerstroke Pro is available in clear, coated and ebony finishes.The new head was in R&D for three years and is constructed from a single-ply/10-mil film of Mylar. 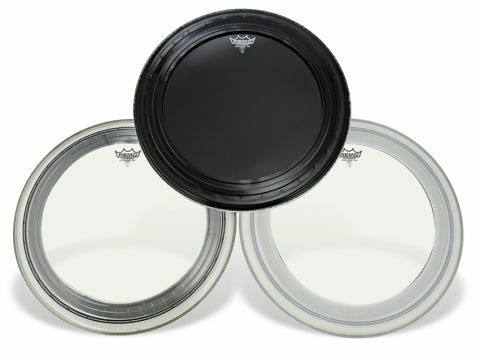 On the front of each head is what Remo calls a Pressure Dampening Profile (PDP). This is a 45mm-wide circle of Mylar located 20mm in from the hoop with two bands of dampening (one felt and one foam ring) slotted permanently inside. "Trying the clear head first, I was impressed by the depth of the note." Contoured ridges are moulded into the circumference of the PDP in order to keep the two dampening rings pressed against the head. The PDP itself is fixed to the head along its outer edge only, through ultrasonic welding - a technique which doesn't require adhesives or glue. On the inside of the head is an additional thin foam ring which, according to Remo, further enhances low end. For the test, I fitted the heads to my 20"x14" bass drum, which has a smooth white Ambassador front head with a Kickport installed. While the Powerstroke Pro's dampening rings cannot be altered or adjusted in any way, my first impressions were that the combination of the felt and foam rings has created a tonally-rounded but controlled sound. Trying the clear head first, I was impressed by the depth of the note. Attack was most noticeable with the tension rods half a turn above flapping. The higher the tuning went, the drier the overall response became, but the balance between resonance and decay was hard to improve on. The super-glossy black head delivered a higher level of 'oomph', particularly tuned low. Here a fat, wet slap sat prominently on the nose of the note, giving the sound a harder, more saturated feel. Tuned up, things became less aggressive but still deep and bassy. Of all three heads, the coated model sounded the most natural. While its response was still focused and powerful, there was more warmth and woodiness. Such sound characteristics mean less attack on tap, but as a compromise between a traditional open sound and more modern controlled, low-frequency heavy sound, I felt it worked. The choice of head is a big factor in any drum's sound; heads such as these have an even greater influence. Rather than faithfully reproducing the drum's voice, Powerstroke Pros manipulate the frequencies and response to deliver power, body and bottom end. When shod with an Ambassador, my bass drum gives an authentic 'boing', but with any of the Powerstroke Pros fitted it sounded like a different drum - larger and deeper than its dimensions would normally allow.